Pont Saint Louis is a continuation of the Pont de l'Archeveche connecting the Ile Saint Louis and the Ile de la Cite (across the Seine). It is a single span box girder bridge. 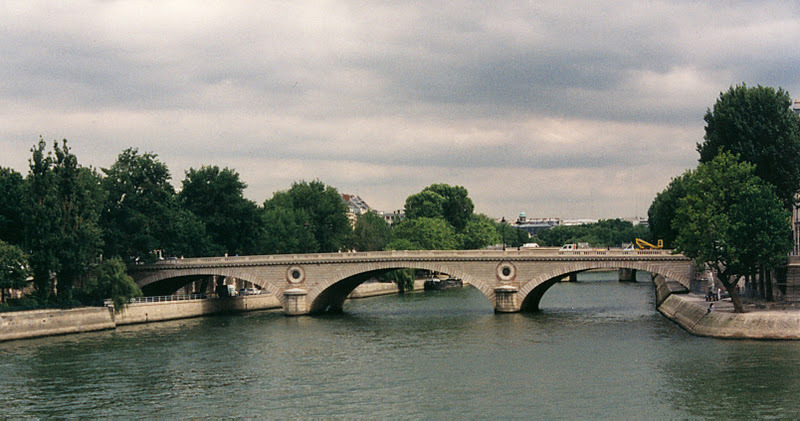 The next bridge that we will look at is the Pont Louis Philippe that connects the Ile Saint Louis to the quartier Saint-Gervaise. It is a three span, stone masonry deck arch bridge. It is 100 m (394 ft) long and 15 m (72 ft) wide. King Louis Philippe of France laid the first stone of an earlier bridge near this location in 1833. The current bridge was opened in 1862. It has distinctive cutwaters and round openings at the piers. The only change since it was built was that the stone balusters were replaced in 1995. Seine River Bridges: Pont Louis Philippe by Mark Yashinsky is licensed under a Creative Commons Attribution-NonCommercial-ShareAlike 3.0 United States License.